1. Chapter 13 ends with a description of the Lord's manifestation in "a pillar of cloud by day and a pillar of fire by night" as He led the Israelites forward. The common Hebrew verb dabar picks up the narrative again. With the new chapter, however, the topic has changed from the Exodus proper to the specific miraculous deliverance of Israel at the Red Sea. The Lord Himself dictates the change through this conversation with Moses. 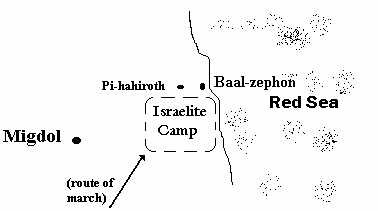 "Tell the Israelites to turn back and camp before Pi-hahiroth, between Migdol and the sea; you shall camp before Baal-zephon, directly opposite it, beside the sea. Israelites: literally, "sons of Israel". Hence God led the people around by the way of the wilderness to the Red Sea. The verb in the passage above is the causative stem of sabhabh, meaning "to cause to turn" or "to cause to go around" (Ex.13:18). BDB(3) explains its meaning in this context as "lead around" - that is, to cause to go by a roundabout way. Thus, as both these passages indicate, the Lord deliberately led the Israelites to the Red Sea by an indirect route which necessitated the change of direction ordered in verse two. It is therefore abundantly clear that far from being something to be avoided at all costs, God intended for the ultimate confrontation with Pharaoh to take place. As events will show, the seemingly erratic route of the Israelites acts as a lure to draw Pharaoh in to his ultimate destruction. Pharaoh has opposed God to a hitherto unprecedented degree, and God will be glorified by his complete and unprecedented manner of annihilation. From our human point of view, the change of direction ordered in verse two was unnecessary inasmuch as the road to freedom was clear. It must have seemed a terrible mistake to many of the Israelites to begin to head back in the direction of Pharaoh's forces, just when they had all but made good their escape. Such questioning of God's directions would reach a fever pitch in verse eleven where the people angrily ask Moses whether his purpose in bringing them out into the desert had been to kill them all along. When we truly commit ourselves to following the will of God, to taking up our cross and following our Savior, Jesus Christ, we are sure to find many instances when someone seems to have gotten the directions fouled up. "Is this really the right way God?" we often are tempted to ask. But the lesson of verse two (and what follows) is that God is, of course, in complete control of things, though we cannot see this so clearly at the time of our testing, whatever it may be. If we could see clearly the exact purpose and method of our God in all things, we would hardly need to "walk by faith, not by sight" (2Cor.5:7) - and faith, after all, is "the assurance of things not seen" (Heb.11:1). So then, believer, what will you do when God makes you change directions, heading you straight back to the same old trouble that you just wriggled your way out of? Will you trust Him, and follow Him - no matter where He leads you? Or will you whine and complain like the Israelites of the Exodus generation did? We all know what eventually happened to them for repeated behavior of this sort (1Cor.10:1-13; Heb.3:12-19). beside the sea: The sea referred to here is the Red Sea, the body of water which divides Africa from the Arabian Peninsula, and includes both the Gulf of Suez and the Gulf of Akaba. In our context, the Gulf of Suez is meant. It is true that many commentators on this passage hold that the sea mentioned here is not the Red Sea but rather any one of a number of lesser lakes and swamps north of the Gulf of Suez. Ultimately, however, the primary reason behind incorrect interpretations of this type is an unwillingness or inability to believe that God actually could or did part the Red Sea as a dramatic act of His power. But any honest interpretation of this part of the book of Exodus - even a secular and anti-Christian one which sees the book merely as literature and in no way divinely inspired - should admit the obvious: that the entire narrative has been constructed precisely to demonstrate the awesome power of God. And so it is clear that even apologists for biblical miracles must see that at least the writer of this episode is telling the story in a miraculous way, and should further accept the fact that the yam, or sea, referred to here (normally called in Hebrew the yam-suph which elsewhere refers to the literal Red Sea) is none other than that famous, large, and never before or since "drained" body of water we know as the Red Sea. Such is the case even if certain of these gentlemen remain unable to accept the true historicity of the narrative. "We have heard how the LORD dried up the water of the Red Sea for you when you came out of Egypt . . . "
By faith they crossed the Red Sea [erythran thalassan = lit. "red sea"] as if it were dry land - though when the Egyptians tried this they were drowned. 2. The Septuagint, the 3rd century B.C. translation of the Hebrew scriptures into Greek, also identifies it as the literal Red Sea (en eruthrai thalassai; Ex. 15:4). 3. The Vulgate, the 5th century A.D. translation of the Bible into Latin, also identifies it as the literal Red Sea (in mari Rubro; Ex. 15:4). a. 1st Ki.9:26: "King Solomon built a fleet of ships in Ezion-geber, which is near Eloth on the shore of the yam-suph in the land of Edom." Present day Elath on the Gulf of Akaba, part of the Red Sea, is unmistakably meant here. b. Num.21:4: "Then they set out from Mount Hor by way of the yam-suph in order to go around the land of Edom." Once again, this is the Red Sea since to go by way of one of the Bitter Lakes or marshes much further north would entail a senseless detour of hundreds of miles! c. Num. 33:11: "And they journeyed from Elim, and camped by the yam-suph." In verse eight of this context, the Israelites had already "passed through" the yam-suph by this time. Now, after journeying southward for some substantial time, and after having made camp successively since then at Etham, Marah and Elim, they find themselves once again at the yam-suph. Such a scenario is not physically possible unless the body of water in question is taken to be the Red Sea (specifically here the Gulf of Suez). you shall camp ..... beside the sea: This designates the precise position of the Israelite camp itself as actually by the sea-shore (as indicated by the Hebrew phrase al ha-yam). 1. For detailed discussions of the route to and from Etham as well as the various locations named in chapters 13-14, see John J. Davis, Moses and the Gods of Egypt (Grand Rapids 1971), G. I. Davies, The Way of the Wilderness (Cambridge 1979), and C. DeWitt, The Date and Route of the Exodus (London 1969). 2. This is further confirmed by the use of the Hebrew preposition al, "up toward", in Num.33:7. 3. BDB is the standard abbreviation for A Hebrew and English Lexicon of the Old Testament by F. Brown, S. Driver and C.A. Briggs (Oxford 1907).